Picked up on this original article from the following link, the attached has been amended, tweaked a little bit. 1. A skiing holiday has to be expensive? Things have changed in the world of skiing – no longer is it an elite sport for the rich. It is quite possible to take a family of beginners skiing and for it not to break the bank. How? - Go self catered. 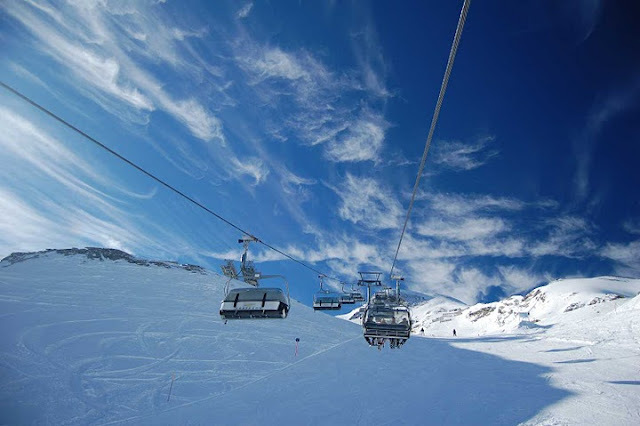 Self catered ski accommodation is often excellent and doesn’t cost very much per head. You can also choose to squeeze more people in on sofa beds to bring the price down even more. Don’t book via large tour operators – go directly to local estate agents or independent property suppliers. - Drive. With four people in a car, and if travelling to areas in the Northern Alps, driving is a very cost effective way of getting to a ski resort. – Try and avoid the main school holidays (Christmas, New Year, Half Term) if at all possible. - Keep an eye on when budget airlines release their flights and book early! - You don’t need to go to the world’s biggest ski area if you are beginners. Go to a smaller resort where you willÂ find everything in resort (lift pass, ski hire etc) to be a lot cheaper. Although skiing does involve travelling downhill on planks of wood without any breaks, the vast majority of skiers who learn to ski with instructors and ski within their limits will have a happy lifetime of incident free skiing. Yes accidents do sometimes happen, but more often than not ski related accidents are less to do with the actual skiing and more to do with amounts of alcohol consumed and not taking care on icy surfaces etc. If you learn to ski properly, you will also learn to ski safely. 3. The weather is cold and horrible when skiing? Well, yes, the weather is usually cold. And sometimes it can be snowing. That is a fact about holidaying in the mountains in winter. However, when the sun comes out in the mountains there is nothing like it. Alpine sunshine, clear blue skies and temperatures of -5 degrees can certainly feel a lot warmer than a UK winter day when the temperature might be 10 degrees. That is why people come back from ski holidays with sun tans! 4. I won’t understand what the ski instructor tells me? Gone are the days when your only choice of ski instructor would be a moustachioed instructor who’s only English was “Bend ze Knees”. Now there are many progressive English speaking ski schools and independent instructors, indeed there are many excellent British instructors working out in the Alps. 5. If I don’t enjoy the skiing, my holiday will be rubbish? If for any reason you don’t get on with the skiing side of a skiing holiday, wintering in the Alps is still an excellent experience. Most resorts have plenty of non skiing activities on offer such as dog sledding, snow shoeing, thermal springs, ice diving, para gliding. Plus many alpine resorts are very picturesque and so sightseeing and shopping aren’t out of the question. It is true that global warming was blamed for the bad winter of 06/07 in the European Alps. However, this was down mostly to lazy journalists not researching their facts properly. The bad winter that year was down to the weather, and not the climate. Plus, the skiing wasn’t actually bad – it just wasn’t as good as it could have been. The last few years have seen some of the best winters for skiing on record. Global warming MAY start to affect European skiing over the next 50 years, but at the moment there is no real evidence that it has started. 7. It is a lot of hassle on a ski holiday? It doesn’t have to be any hassle. You can opt for a catered chalet holiday where all you need to do is get yourself to the airport. The rest is taken care of by the chalet hosts. You are picked up at the airport and taken to your chalet, they arrange your lift passes and ski hire, they cook for you, they clean for you and they take you to the slopes every day. Where is the hassle in that? 8. My kids will have problems in French / German speaking in the crèche / ski schools? Like the point about ski instruction, things have changed a lot in the world of Alpine childcare. Crèches and kids’ ski school usually have English speaking staff, and it is not unusual to find a number of British kids in classes during the school holidays. Teaching your kids to ski at a young age is one of the greatest gifts you can give them! 9. I don’t like mountain food? Nowadays, eating out in ski resorts isn’t all about cheese and ham (although there is plenty of that on offer for those who look forward to their annual fondue or raclette). Most resorts now sport a wide variety of restaurants – some with real cosmopolitan ambiance and menus. And if you don’t want to eat out every night, a trip to the local supermarket will reveal that the gap between German / French and British food shopping has narrowed considerably over the last few years. 10. I can’t take a baby skiing? Nearly all ski resorts have excellent crèche / nanny facilities. And for those people who worry about the cold/altitude etc, don’t forget that babies are born in the mountains every year and they do OK! Hopefully the above will help to dispel the main worries of a nervous first time skier. And if you never try it, you might never know what you are missing! I liked the article and thought is was well written, I recall Stephen Fry of BBC fame who recently was advocating the joys of a ski holiday even though he did not ski, enjoying the scenery, food, drink and banter! If you are looking for somewhere to stay then please consider Austrian Holiday Apartment in Kaprun ideal for 3- 9 guests. Great blog. Looking forward to reading some more!